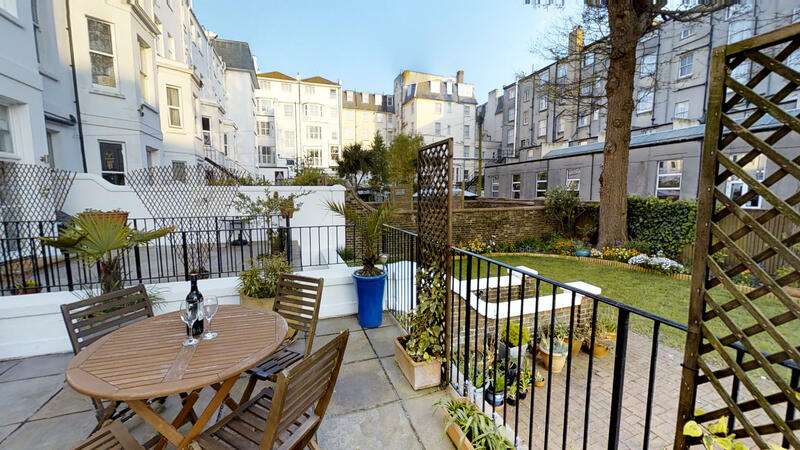 This luxury holiday apartment rental in Eastbourne is set in a beautiful Grade II-listed building on a tranquil side street just moments from the seafront, pier and Eastbourne bandstand. Stylishly renovated and on a raised ground floor, the holiday apartment is modern, comfortable and extremely well equipped. You’ll enjoy the high ceilings and large original sash windows which allow natural light to cascade throughout, creating a wonderful sense of space and serenity. The open plan living space includes a high-end, modern fitted kitchen with granite worktops, dishwasher, microwave, fridge-freezer, ceramic hob and electric oven, a lounge with large flat-screen TV with Freeview, and French doors leading to a private south-facing sun terrace. There is a separate utility room which houses a washer-dryer, plus you will have full control of the underfloor heating system if evenings turn slightly chilly, and you’ll have lashings of hot water available at all times to enjoy the huge bath for decadent evenings in. This central Eastbourne holiday apartment rental offers two bedrooms – one master bedroom with kingsize bed and ensuite shower room, and one twin bedroom. Both bedrooms have televisions, so there’s no need to argue over viewing. There is also a separate family bathroom with a large bath and shower over. The Arndale Centre (currently undergoing a £70 million upgrade with a new cinema complex, new shops and restaurants) is a very short stroll away, as is the train and bus stations (both seven minutes away). This luxury holiday apartment rental in Eastbourne is well stocked with all the utensils you’ll need for self catering accommodation. It is located on the ‘hall’ floor of the building, with eight steps up to the main front door of the building and then is all on one level, making it a good option for those needing accessible accommodation. There is a lift to take you out into the gardens and the bin/recycling area. Of course, you’ll find free WiFi, all towels and linen, including an extra set if your stay is over a week (as in all our holiday homes Eastbourne), There will also be a few starter cleaning supplies, such as Fairy Liquid and a few dishwasher tablets, plus mini toiletries in the bathrooms and enough tea and coffee for a welcome drink. Parking permits are available for just £1 per day (free on Sundays) which allow to park across a wide-section of Eastbourne. Bookings run from Saturday to Saturday in peak season, although flexible arrival days and short stays may be possible out of season and at the last minute. Spotless, modern and well equipped - with best location. Loved our little terrace in the afternoon sun! Lovely flat. Flat is very well positioned near to the seafront and bandstand. On street parking nearby was never a problem. Lots of really good restaurants and shops on Terminus road, which is 5 minutes walk away. The flat has everything you need, including WiFi, and a nice patio at the back. We've just had our second visit so that says it all really. A comfortable and clean apartment with very good facilities. 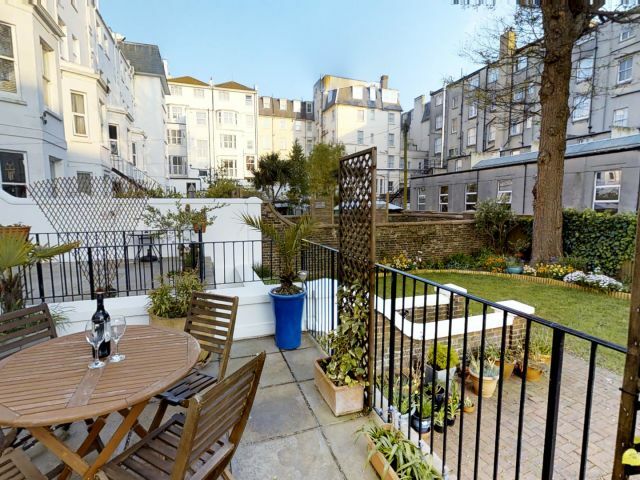 Great central location, two minutes from the seafront and close to shopping areas. Carl and Sarah very helpfully answered any queries we had and they also gave us useful local advice. We were made to feel welcome and really enjoyed our stay. A place that has everything to offer that you could dream of. Conveniently situated close to all the local amenities - close to the sea and to the city centre. Tasteful, luxurious interiors and extremely welcoming and accommodating property managers! This apartment is a really excellent place to stay in Eastbourne. It is well decorated, has a lovely patio which is fantastic to sit out on when the weather is good and the bedrooms are surprisingly quiet, given that they look onto the road. The positioning is perfect - minutes from the sea and the town and easy to get to the station. You couldn't want for more. The managers are really helpful and do whatever they can to make your stay a good one. Thoroughly recommended. I would come back here again. Sarah and Carl are great hosts and were very easy to deal with right from the beginning. I felt very much at home at the apartment that boasts everything up to four people might ever need. I found a very quiet and spotless apartment with a stylish interior and modern appliances. Location cannot be beaten. It's just 100 yards from the beach and 200 yards from the main shopping street. The place is easily walkable from the train station (10 min). Modern family home - clean and tidy, great location. Me and my family spent Christmas 2012 at Gresham House. Carl and Sarah are fantastic property managers they made us feel very welcome. 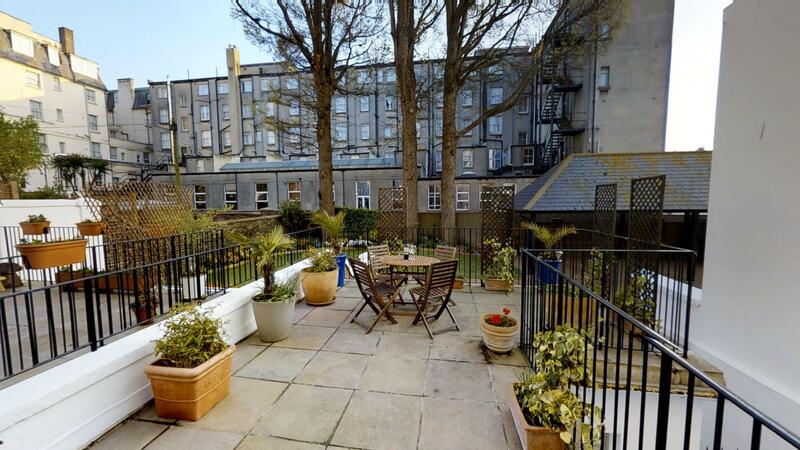 The flat is in a beautiful building in a superb location close to the sea. Inside it is modern and functional - the kitchen is well equipped and the bedrooms are a great size. I would have no hesitation in recommending the property to anyone looking to rent at any time of the year. Everything you could possibly want! Whether your stay is short or long, for business or pleasure, you will have a most enjoyable time at Gresham House. It quite literally has everything you could need: inside your hosts have thought of every convenience from a garlic press to an umbrella while outside you will find the beach two steps one way and the town centre two steps the other way. There is on street voucher parking right outside and a very reasonable priced, secure long stay multi storey moments away and unless you want to explore further afield than Eastbourne you really won't need the car - the shops, huge range of restaurants and eateries, theatres, a cinema, galleries, the prom, the pier and the bandstand are all on your doorstep. Within the apartment, which is very intelligently laid out, nicely appointed, tastefully decorated and furnished you can relax in complete comfort. The comprehensive kitchen means eating in is as good an option as dining out. As well as a generous main bathroom there is also a spacious en suite and the master double bedroom and twin bedded second have oodles of linen and towels and very comfy beds. 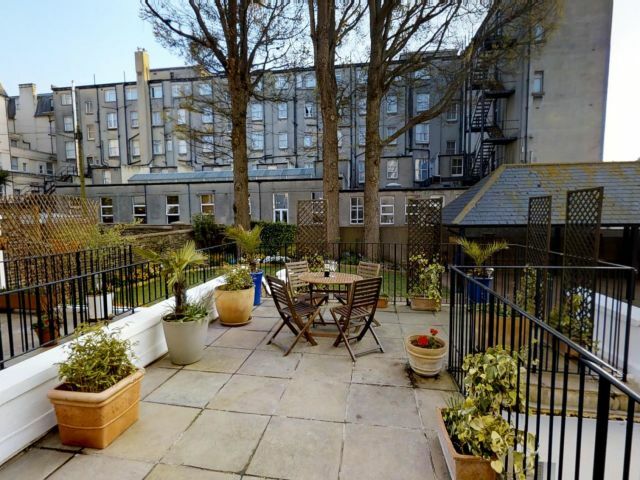 There is even a sun trap private terrace within the tranquil lawn and courtyard area. Carl and Sarah and the team at Exclusively Eastbourne are thoughtful and attentive hosts - you really will want for nothing and we are delighted to recommend them. Have stayed at this apartment a few times and it never disappoints. Great location, near the seafront, comfy beds, two bathrooms, patio at the back, everything you need for a great holiday. Carl and Sarah are always helpful, nothing is too much trouble. Highly recommended. Our favorite place in Eastbourne. Top location 200 meters from beach and 5-10 minutes to the rest of town. Under floor heating for cool season is very nice. Super clean, quality furniture & fittings, excellent management. Highly recommended. A taste of luxury in beautiful Eastbourne. A luxurious and quiet apartment that lacks for nothing to make one's stay a pleasure. My wife and I would often say "look, there is even a such-and-such". And how enjoyable it was to sit and have breakfast while being entertained by the squirrels in the garden. An absolute topper of an apartment. The place is kitted out very well especially the kitchen. It’s a very lovely apartment. I couldn’t fault it. It's excellent value for money. The Exclusively Holiday Homes Ltd and her staff was from the beginning to the end of our stay was helpful for all ours questions and needs. The location of the Apartment surprised us for its position a 5 minutes food walk from the ELC language school and also only 3 minutes from the charming seaside. Not much further we found the urban centre of the town. Ideal for ambling, shopping and coffee breaks. The outstanding comfort and infrastructure of the flat equipped with best qualities of household appliance makes you just feel at home. Ideal for self catering. Beautiful, modern apartment, everything looks EXACTLY as on the pictures. Perfect location, and very friendly welcome from Carl upon arrival. We can definitely suggest both hosts and flat. Thanks for a wonderful stay! Super Apartment! This is our second trip to Eastbourne. We really enjoy the (good old school) service from Sarah and Carl. They are always 100% reliable. Gresham house is perfect! (2 adults 2 teenagers from Norway). Its located near the beach and the city center. The flat has a Nice living room and Kitchen, two bedrooms, two baths, and a nice patio. The flat is modern and functional. We really enjoyed the two weeks here and will surely come back! Costs include the weekly rent, a £30 booking fee and a returnable £200 security deposit. To book this luxury holiday apartment Eastbourne requires an immediate, non-refundable deposit of £200 (booking fee and a portion of the rent) and then the balance, including the security deposit, is due by no later than six weeks before your arrival. For stays of three weeks or more, you may be asked to pay a higher security deposit and/or booking deposit.